Lyric Opera of Chicago has created an energetic new production of Verdi’s early masterpiece Ernani. In the program, soprano Sondra Radvanovsky says that Ernani deserves to be ranked with such other great Verdi operas as Il trovatore and Un ballo in maschera, and this new production audibly and dramatically makes the case for the claim. Led by conductor Renato Palumbo, the cast brings a sense of freshness to the work with exemplary singing, fine diction, and tight ensembles in this tautly constructed drama – based of course on Victor Hugo’s 1830 play Hernani. The performances on this second night of the run conveyed a true sense of Ernani’s rightful place among Verdi's operas. Sondra Radvanovsky stands out in this production for her vocally and dramatically captivating depiction of Elvira, a woman with whom three of the most powerful men of her generation are passionately in love passion. Elvira loves only one of them, the bandit Ernani, and her devotion to him propels the action along to its inevitably tragic conclusion. Radvanovsky defines her character from the outset; her deep longing to be reunited with Ernani prompting her to reject the advances from her uncle and guardian Gomez de Silva. While showing that she can dismiss Silva’s many gifts with no more than a single gesture, the cavatina “Ernani, involami” provides a more explicit expression of her emotions in a remarkable performance of this well-known piece. This is bettered only by Radvanovsky’s virtuosic singing in the cabaletta “Tutto prezzo” which follows: there is exactly the kind of clarity and evenness here that the music requires, along with a sense of style in expressive vocal shadings and acting that underpin the outstanding musical quality of the performance. When she is confronted in the next scene by Boaz Daniel’s Don Carlo, Elvira’s rebuffs are even more convincing. Yet the trio “Tu se’ Ernani” stands out for the energy provided these singers along with Salvatore Licitra in the title role. Reunited with Ernani, Elvira is clearly captivated by him, and Radvanovsky gives voice to her emotion vividly, yet never compromises her focused performance. The sheer depth of feeling in Radvanovsky’s singing captured the imagination yet again at the beginning of the second act, Scott Marr’s stunning setting of Silva’s hall, in which she stands with her back to the audience. Reflecting a Renaissance painting, Marr’s impressive tableau seems to come alive when Radvanovsky turns to declare her intention to commit suicide at the altar if she is to be married to Silva, with the dagger neatly tucked into the sleeve of her costume. As the drama takes a new turn with Ernani and Silva’s realization that Carlo is their mutual enemy and when Ernani promises to take his own life at Silva’s wish, if the old man will join him in taking revenge on Carlo for making Elvira his hostage, it becomes clear that Director Jose Maria Condemi’s decision to make the most of Elvira’s threat at the beginning of the Act since Radvanovsky portrays Elvira as a strong and determined woman, a stance which she confirms vocally in an ever more commanding performance. As Ernani, the Italian tenor Salvatore Licitra provides a fine portrayal of the title character. His ringing tone is prominent from the start, where he explains his longing for Elvira to his band and informs the men of his decision to rescue his beloved from Silva. While Licitra was reported as ailing for the opening night of this production, his performance on the second night of the run (31st October) gave no indication of any weakness on his part. All in all, his extroverted approach to the role, and reliably solid tone in the solo passages, makes Licitra a strong member of all the ensembles. His duet with Elvira in the second act, “Ah, morir, potessi adesso” also stands out for the way Licitra matches Radvanovsky’s passion. Similarly, the duet between Ernani and Silva - “A te, scegli, seguimi” - defines Licitra and Giacomo Prestia characters very convincingly as they sing to the nicely angular accompanying figures in the orchestra. Boaz Daniel’s Carlo is equally musically persuasive in both his lyrical passages and the sections of accompanied recitative, bring out the full meaning of all of his texts. Carlo in the first act as Elvira’s suitor of course and by the third has become Holy Roman Emperor. At the beginning, his lines express only his attraction to Elvira and political machinations, yet by the end of Act III, he has moved beyond such limited concerns to become the voice of unity and compassion. Daniel’s fine musical and dramatic style he brings to this production, illuminates this transition marvelously, highlighting his changing moods and attitudes with great ease and finesse. Giacomo Prestia makes his Lyric Opera debut with some distinction in the role of Silva , bringing a distinctive and articulate voice to all of Silva’s music. As obsessive as his character may be, Prestia never lets the the character’s changing emotions overwhelm the musical demands of the role. His aria “La vedremo, veglio audace” in the second act, where he protects Ernani from arrest by Carlo’s forces under the obligations of hospitality is impressive, and gives some depth to a character who can seem one-dimensional in other productions. But Silva’s character is in fact quite complex: he moves from being Elvira’s suitor to an alliance with Ernani against Carlo – for the price of the right to demand Ernani’s death at sound of a horn call – through to becoming willing to kill Carlo himself when lot-casting selects Ernani as the assassin. When Carlo’s pardon for the rebels signals that the assassination has become pointless, Silva’s implacable stubbornness returns to thwart Elvira’s happiness at her marriage by holding Ernani to his oath. Prestia’s interpretation was believable at every turn. Supporting this excellent cast, Renata Palumbo’s conducting is vivid and exciting. In the overture alone, he brings out details that sometimes escape studio recordings of Ernani, with full orchestral textures emerging with deftness and clarity. He presents the entire score masterfully. It is also important though, to note how the period-informed set designs by Scott Marr also support the text. The confined sets in the first act contribute to the sense of Elvira’s trapped situation and in the second act, tiles and chandeliers suggest the opulence of Silva’s palace. 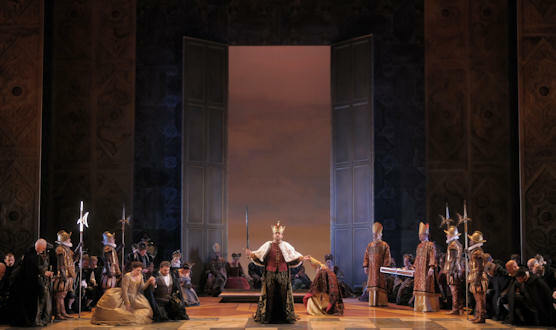 Yet the real challenge of the work is to make Carlo’s coronation at the end of Act III seem appropriately regal, and the production offers a fine solution to the dramatic situation by allowing the setting for Charlemagne’s tomb – where the act begins - to transform into the coronation seen sets that allow light to stream in from the back of the stage. While the set changes between the two scenes of the first act and between the third and fourth acts may seem long, they are inevitable when they involve such a radical transformations. This Ernani is one of Lyric’s more inspired offerings. In presenting this early Verdi, it captures the style of the piece vividly, with an outstanding cast. Licitra and Radvanovsky are remarkable and Radvanovsky in particular stands out among the international cast. In a production of this quality, it is easy to agree with Radvanovsky’s view that Ernani ranks with Un ballo in maschera or Trovatore, despite general opinion to the contrary.